Texas quarterback Colt McCoy (12) escapes a handful of Rice defenders as he scrambles over his right end for an eight-yard touchdown Saturday in Austin, Texas. McCoy later passed Major Applewhite for the Texas all-time record in touchdown passes with 62. 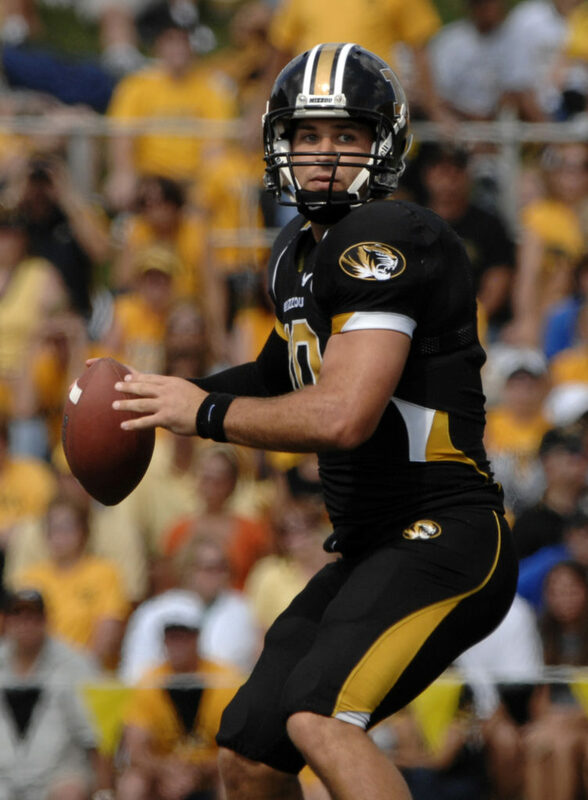 Missouri quarterback Chase Daniel prepares to throw against Buffalo on Saturday in Columbia, Mo. Daniel set a Big 12 record for consecutive completions in a game last week with 20. Missouri’s Chase Daniel and Texas’ Colt McCoy recently threw themselves – literally – into the Big 12 Conference football record books. Daniel set a conference record for consecutive completions in a game with 20 in Missouri’s 42-21 victory over Buffalo on Saturday, eclipsing the previous marks of 18 by Sam Bradford (2007) and Seneca Wallace (2001). A few hours later, McCoy became the Longhorns’ all-time leader in touchdown passes with 62 in UT’s 52-10 cakewalk over Rice. McCoy leapfrogged current Texas running-backs coach Major Applewhite’s previous mark of 60. Will Big 12 fans see more records broken this year? Some might say absolutely, considering six of the top 10 quarterbacks in the nation this season in passing efficiency (Bradford, McCoy, Daniel, Zac Robinson, Robert Griffin, Josh Freeman) hail from the Big 12. Most unbreakable: Texas Tech quarterback B.J. Symons’ 5,883 passing yards in a season, 2003. The mark is an all-time NCAA record. For reference, that averages out to 448.7 yards per game. Semi-unbreakable: Symons’ 661 passing yards in a single game vs. Mississippi, Sept. 27, 2003. Any 2008 candidates to break these marks? : When it comes to completions, attempts and yards, Texas Tech owns all nine records listed in the 2008 Big 12 media guide. Therefore, the only candidate to break Symons’ records is not surprisingly the Red Raiders’ 2008 signal-caller, Graham Harrell. Progress-check on the single-season yardage mark: Through four games, Harrell has averaged 393.3 yards per game. What a slacker. Most unbreakable: Iowa State tailback Troy Davis’ 378 rushing yards in a single game vs. Missouri, Sept. 28, 1996. Semi-unbreakable: Texas halfback Hodges Mitchell’s 45 rushing attempts in a single game vs. Texas Tech, Nov. 4, 2000. Candidates in 2008: No selection. Gone are the days of pounding the football on the ground in the Big 12. The best rushing team in the Big 12 – Oklahoma State – possesses a committee with Kendall Hunter, Keith Toston and Beau Johnson, diminishing the Cowboys’ chances at the records. Most unbreakable: Oklahoma State wideout Rashaun Woods’ seven TD’s in a single game vs. SMU, Sept. 20, 2003. Semi-unbreakable: Texas A&M wideout Albert Connell’s 18 receptions in a single game vs. Colorado, Sept. 28, 1996. Candidates in 2008: For Woods’ record, it would have been Texas Tech’s Michael Crabtree against a nonconference opponent, but the Red Raiders’ nonconference schedule is over, so scratch that. As for Connell’s record, it’s pretty safe. KU possession receiver Kerry Meier could be a contender to break it, but the Jayhawks likely have too many options for the Pittsburg native to approach 18 receptions in one game. Missouri’s Jeremy Maclin caught 14 passes last week against Buffalo, but like KU, Missouri has too many weapons from which to choose.